This is a new dish at La Villa for 2018 – light, zesty and perfect as a starter on a warm summer’s day. Have all of your ingredients to hand as this is one dish you need to make fresh & serve straight away. Using a sharp knife, slice the courgette as thinly as possible (or, if you have one, use a mandolin). Arrange on your serving plate; a white plate is best to show off the colours. Give a sprinkle of sea salt, a drizzle of olive oil & a squeeze of lemon juice. 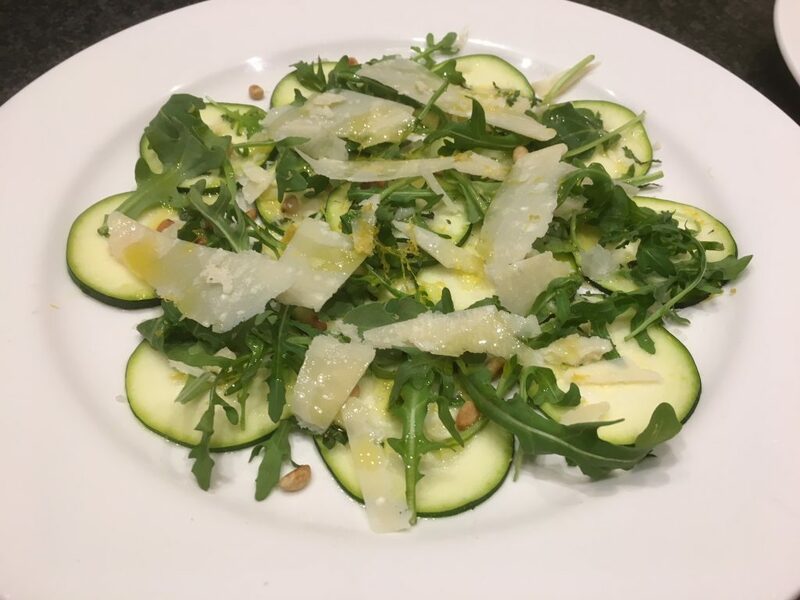 Scatter over a few rocket leaves, toasted pine nuts and Parmesan shavings – finish by grating the lemon zest on top and a final drizzle of olive oil.